Last semester, a student of mine said to me in reverent awe that "as a teacher you're always in front of people trying to make a good impression and saying the right things"; he was speaking in reference to his choking performance during a presentation. He could not speak in front of others without worrying about how his peers were viewing him. I laughed it off and told him that with age you lose your insecurities and concern for others' judgments. As soon as he left the classroom, I asked myself, though, was that really true? And more importantly, is it a good thing to not care what others think? First, his comment about a professor's job floored me. I probably never say the right thing (pop culture references and allusions to their partying sometimes takes us on tangents) and I probably rarely make a great impression on students (was that joke a bit too self depreciating? Did I undermine my authority trying to relate to them?). Yes, there are those amazing days that happen frequently where students are interested, understand the material, and I feel like I'm really getting through to them. And then there are days that I feel like I'm talking to a room full of the walking dead. A concussion bomb could go off in the room and no one would even flinch. I could claim that I don't concern myself with what others, especially students, think of me, yet I do. I want to be the professor whose class they can stand going to, that they look forward to, make them proclaim they like English for the first time. The fact this only happens a few times a year is sad, but there's only so much I can do. Not everyone has the passion for reading and writing that I do. Over the last couple years I have begun to get comfortable in my role, perhaps too much, and that strict totalitarian professor teaching style has completely given way to a laid back older sister role: they love me and hate me but know they should listen to what I have to say. Most professors would cringe and scold me for not keeping my distance, keeping things in line, being professional. However, I truly believe, at least with this generation, being a cold authoritarian in the classroom does not yield results and students don't learn as much as they would have in a more comfortable environment. My student with stage fright had a very good point. He viewed my role as a professor the way a student would discuss a high school teacher, one who must make a good impression and say the right things. He has reminded me that these first-year students I get each semester fall in this quasi-adult role, not a child yet far from an adult. I can always tell a freshman from upperclassmen; there's a glaring naivety to them, a lack of life experience, and I must always remember that they are still growing as individuals and it is part of my job to foster that. 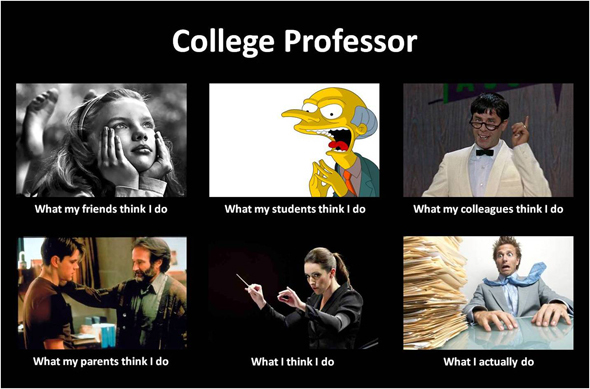 About two years ago, I changed as a professor all due to a student of mine. He was a return student, as in he took me for a prior course. He was a great student, but at the end of the first course he missed classes, his grades slipped, and even though he gave me a documented excuse, I wasn't sure what else I could do for him. His best friend had committed suicide which affected him drastically. A couple weeks later, he seemed somberly adjusted and his grades were back on track. Summer break occurred, he returned in my next class, and all seemed well until the one day he asked to speak to me outside before class. He was very preoccupied, and when I asked what was wrong he burst out crying. It was supposed to be his friend's 18th birthday and he didn't know why he was so upset but he just couldn't deal with it that day. I knew exactly what it was. I watched him stagger briefly in life and then suppress his emotions about his friend. All it took was the stress of midterms, loneliness, a struggle over majors (doing what he loved versus a more lucrative major that would satisfy his family), and homework about a suicide poem to set him off into a spiral of depression. He was having a breakdown, in front of me, right when I had class starting and 19 others waiting for me. I was able to calm him down by listening, understanding, explaining to him that we all need help dealing with these things, and that he hasn't fully faced it head on until now. I could see that he had no one that understood him. I was it. He hugged me, and I soothed him as I would my own son not caring if it was breaching academic decorum. After insisting he go to counseling services (I was very insistent on the point) I had to go in and teach two classes back to back. I "performed" well considering my thoughts were with him, and I was very worried he could possibly take his own life as well. Thankfully, he went and spoke with counselors, afraid I would be mad if he didn't (okay, I was frighteningly insistent he go) which was very true, and they helped him tremendously. After that day, we would talk; he'd talk to me after class, sometimes walking me to my next classroom across campus or visiting me in my office. Sometimes they were serious conversations, but mostly trite everyday conversations. I realized he needed someone, a friend, and by sparing him ten minutes a day I could make a huge difference in his life. And he did mine. He made me realize being a professor isn't just teaching material and grading papers. It is being a friend, role model, a helping hand. This boy reminded me that they are not adults yet, that they do need help growing up, and professors are a part of that whether we like it or not. I see this student still from time to time and he always spares a few minutes to catch up. I can tell he's doing much better and how grateful he is for my help when he needed it. And it fills me with gratitude to see that I had the power to change someone's life, that I made a positive impact. I'm pretty sure it was this student, and several others that I've dealt with since, that nominated me that year for an Apple Award. The recognition is one thing but to see and hear students tell me I made a difference matters much more. As daily life and stress builds upon me, I try to remind myself that I am needed, that I do have an affect on people, that how I behave does matter. And so, this innocuous comment, "as a teacher you're always in front of people trying to make a good impression and saying the right things," reminds me that my daily attitude matters. I must care what people think, must make a good impression, and most importantly, try to say the right thing--at least when it matters.